AU - Kim, Ji Young. AU - Choi, Yoon Ju. AU - Kim, Jong Soo. AU - Kim, Do Hoon. AU - Do, Jung Ah. AU - Jung, Yong Hyun. AU - Lee, Kang Bong. AB - BACKGROUND:Accurate and simple analytical method determining Fluxametamid residue was necessary in various food matrices. Additionally, fulfilment of the international guideline of Codex (Codex Alimentarius Commission CAC/GL 40) was required for the analytical method. In this study, we developed Liquid Chromatography-Tandem Mass Spectrometry (LC-MS/MS) method to determine the Fluxametamid residue in foods.METHODS AND RESULTS:Fluxametamid was extracted with acetonitrile, partitioned and concentrated with dichloromethane. To remove the interferences, silica SPE cartridge was used before LC-MS/MS (Liquid Chromatography-Tandem Mass Spectrometry) analysis with C18 column. Five agricultural commodities (mandarin, potato, soybean, hulled rice, and red pepper) were used as a group representative to verify the method. The liner matrix-matched calibration curves were confirmed with coefficient of determination (r2) greater than 0.99 at calibration range of 0.001-0.25 mg/kg. The limits of detection and quantification were 0.001 and 0.005 mg/kg, respectively. Mean average accuracies were shown to be 82.24-115.27%. The precision was also shown to be less than 10% for all five samples.CONCLUSION:The method investigated in this study was suitable to the Codex guideline for the residue analysis. Thus, this method can be useful for determining the residue in various food matrices as routine analysis. Kim, J. Y., Choi, Y. J., Kim, J. S., Kim, D. H., Do, J. A., Jung, Y. H., Lee, K. B., & Kim, H. (2019). Study for Residue Analysis of Fluxametamid in Agricultural Commodities. Korean Journal of Environmental Agriculture, 38(1), 1-9. Kim, Ji Young et al. “Study for Residue Analysis of Fluxametamid in Agricultural Commodities.” Korean Journal of Environmental Agriculture 38.1 (2019): 1-9. 1. Kim JY, Choi YJ, Kim JS, Kim DH, Do JA, Jung YH, Lee KB, Kim H. Study for Residue Analysis of Fluxametamid in Agricultural Commodities. Korean Journal of Environmental Agriculture [Internet]. 2019;38(1): 1-9. Available from: doi:10.5338/KJEA.2019.38.1.5. Kim, Ji Young, Yoon Ju Choi, Jong Soo Kim, Do Hoon Kim, Jung Ah Do, Yong Hyun Jung, Kang Bong Lee and Hyochin Kim. “Study for Residue Analysis of Fluxametamid in Agricultural Commodities.” Korean Journal of Environmental Agriculture 38, no.1 (2019): 1-9. doi: 10.5338/KJEA.2019.38.1.5. Fluxametamid (IUPAC name: 4-[5-(3, 5-dichlorophenyl)-5-(trifluoromethyl)-4,5-dihydro-1,2-oxazol-3-yl]-N-[(methoxyimino)methyl]-2-methylbenzamide) is an isoxazoline insecticide and acaricide (Asahia et al., 2018, Kagami et al., 2017) developed in 2007 at Nissan chemical industry (Chiyoda-ku, Tokyo, Japan). The action mode of this chemical is inhibiting transfer of gamma-amino butyric acid (GABA) which controls muscle activation at synapses and gland stimulation in insect and arachnid. Additionally, this chemical can effect to phenlpyrazole- resistant insect due to having different acting sites (Kagami et al., 2017, Turner, 2016, Ozoe et al., 2010, Zhao and Casida, 2014). Thus, Fluxametamid shows a strong insecticide effect against various species, and even used veterinary drug against flea and tick (Bloomquist, 2003). The application of its registration for apple was submitted to Rural Development Administration, while maximum residue level setting was to Ministry of Food and Drug Safety (MFDS) on 2016. However, Fluxametamid is not registered in US and Codex Alimentarius Commission (CAC). Thus, any officially recommended methods for analyzing fluxametamid are not available. MFDS adapted Positive List System for tree nuts/oil seeds and tropical fruits since Dec. 2016 (MFDS notification No. 2015-78(’15.10.29)). And this system is expended to all agricultural commodities by Jan. 2019 (MFDS notification No. 2018-8(’18.02.22)). MFDS has been established simultaneous analytical method for multi-residue using simple sample preparation and detection processing. Also, the possibility for expending registration of fluxametamid for other crops cannot ignore due to its broad spectrum for insecticide activity. Therefore, analytical method for fluxametamid residues in various food matrixes was needed. The purpose of this study is to develop a government-official method, which is applicable for several food matrixes. For matrix-matched calibration, five representative produces (mandarin, potato, red pepper, soybean and hulled rice) were used. The accuracy and specification of analytical method were compared to Codex guideline (CAC/GL 40). Fluxametamid (purity 94%, Fig. 1) were supplied by Kyungnong chemical (Seoul, Korea) and its physicochemical characteristic summarized in Table 1. HPLC grade of acetonitrile, dichloromethane, and hexane were purchased from Merck (Darmstadt, Germany). SPE cartridge (1 g, 6 cc) was bought from Waters (Milford, USA). Other reagents used in this study were purchased from Wako Pure chemical industries (Osaka, Japan), Merck (Darmstadt, Germany), or Sigma Aldrich (St. Louis, MO, USA). All reagents and organic solvents were of analytical grade. Stock standard solution (1,000 mg/L) was prepared in acetonitrile. For matrix-matched calibration, stock working solution (1.0 μg/mL) was prepared by adding 100 μL at 900 μL of control sample extraction. Then, series of solutions (the concentration levels 0.001, 0.005, 0.01, 0.05, 0.1 and 0.25 μg/mL with sample matrix background (> 90% v/v)) were made (Table 2). All solutions were stored in amber vials at 4℃ until further analysis. In this study, five representative agricultural commodities were chosen based on Codex classification of food and feeds (Codex, 2003), Korea (Ministry of Food and Drug Safety, reserved edition on 2017.05.08), and domestic food consumption (Lee et al., 2010): mandarin orange for citrus group, potato for root vegetables group, red pepper for vegetable group, hulled rice for cereal group, and almond for nut group. Organic (non-pesticide treated) five representative agricultural commodities from local market (Seoul, Korea) were purchased. Sample preparation was followed by MFDS-Food Code method (Ministry of Food and Drug Safety, reserved edition on 2017.05.08). Briefly, samples (at least 1 kg per commodity) were chopped, homogenized and kept at -20℃ until further analysis. Briefly, 10 g of homogenized sample were extracted with 50 mL of acetonitrile by mechanical shaking for 10 min. After vacuum-filtration, the filtrate was concentrated to dryness by the rotary vacuum evaporator at below 40℃. For mandarin orange, potato, and red pepper, the concentrated extract was diluted with 100 mL of distilled water, and then shacked with 20 mL of saturated saline and 30 mL of dichloromethane sequentially. The organic layer was dehydrated by passing through anhydrous sodium sulfate and concentrated to dryness by the rotary vacuum evaporator at below 40℃. Finally, the concentrated samples were diluted with 10 mL of dichloromethane. For hulled rice and almond (foods with high oil content), 30 mL of n-hexane instead of distilled water were used for diluting the concentrated extract. Then, 30 mL of acetonitrile were used as a separating agent instead of saturated saline and dichloromethane. The further steps are the same mentioned above. SPE‐silica cartridges were activated with 10 mL of dichloromethane at rate of 2-3 drops/sec. Five mL of working solutions containing sample matrix were applied to activated SPE-silica cartridge. Then, the cartridge was washed with 5 mL of dichloromethane. The analyte was eluted with 10 mL of acetone/dichloromethane (5:95, v/v), and the elution was concentrated to dryness by the rotary vacuum evaporator at below 40℃. LC‐MS/MS system consisted of Acuity UPLC (Waters, Millford, MA) and Xevo TQ-S tandem quadruple mass spectrometer (Waters, Milford, MA) were used in this study. LC separation was carried out in Unison UK-C18 column (100 x 2 mm, 3 μm, Imtakt, USA). 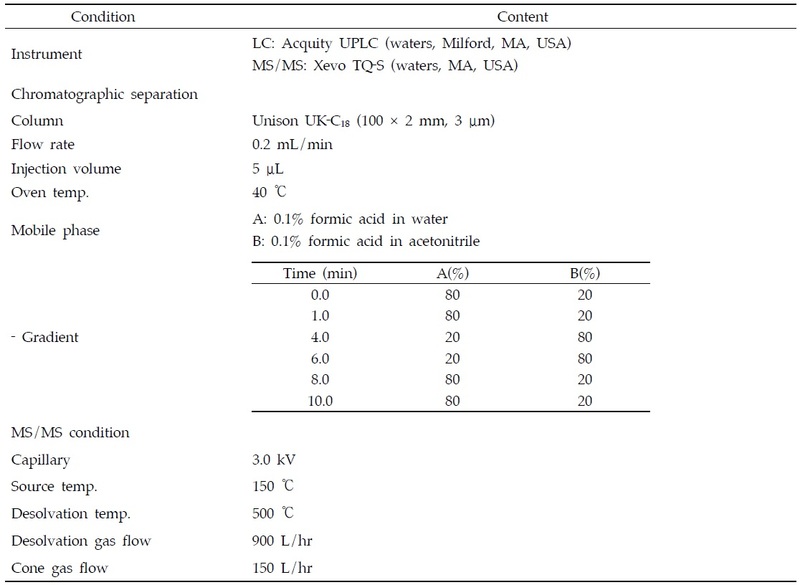 The injection volume was 5 μL, and the analyte was eluted in 0.1% formic acid-acetonitrile at the flow rate of 0.2 mL/min. After confirming no interference from non-pesticide treated samples, limits of quantitation (LOQ) was calculated based on limits of detection (LOD) and concen tration ratio (Ahn et al., 2014). To validate accuracy and precision, recovery test was investigated. The purpose of this study is 1) developing an analytical method for fluxametamid residue that can be applied various matrix and 2) possible to expend to multi-residue detection. MFDS has been enforced Positive List System for “nuts/seeds and tropical fruits” since Dec. 2016 (MFDS notification No. 2015-78(’15.10.29)), and expend to all agricultural commodities on 2019 (MFDS notification No. 2018-8(’18.02.22)). Thus, developing routine analytical method using same clean-up steps from different food matrices is necessary. In this study, Fluxametamid was analyzed using LC-MS/MS following by liquid-liquid extraction and SPE cartridge clean-up. Additionally, the main metabolites of fluxametamid are CM-2, -3 and -4 which were confirmed by metabolism studies in eggplant, lettuces, and strawberries (data not shown due to company confidence). However, this study did not consider these metabolites as a part of residue definition, because these are less than 10% of total residue (FAO/WHO manual, 2016). Extraction Fluxametamid is non-polar (Log Pow=5.0) and non-ionic pesticide at pH 4-12 (Turner, 2016). For high-water contented foods, residue of fluxametamid can be presented either on or inside of water molecules. Furthermore, water molecules might be pre-occupied on the surface of food matrix. Thus, non-polar organic solvent can result in poor extraction due to lower penetration thorough the matrix. Thus, acetonitrile, hydrophilic organic solvent, were used to improve elution of fluxametamid either on or inside food matrix. In this study, extraction with acetonitrile showed more than 95% recoveries from all 5 representative agricultural commodities. To remove interference, concentrated acetonitrile extract was diluted with 100 mL of distilled water and applied to liquid-liquid partitioning with dichloromethane. NaCl was added in the purpose of 1) improving separation by increasing ionic strength and 2) preventing polar impurities transfer into organic phase. Recovery of partitioning was good enough (> 95%). For high oil contented foods (hulled rice and soybean), additional partitioning with hexane/acetonitrile were added to eliminating non-polar interference such as oil. Clean‐up For finding optimal condition of solvent and ratio of solvent applied to SPE (florisil and silica) cartridge, five different solvents and its ratio were investigated. Table 3 summarized recoveries depending on solvents and their ratio. To investigating the proper solvent for simultaneous multiple residue detection, 5 different solvents (acetone/n-hexane, ethyl acetate/n-hexane, dichloromethane/n-hexane, ethyl acetate/dichloromethane, and acetone/dichloromethane) were tested in this study. Acetone/n-hexane, ethyl acetate/n-hexane, and dichloromethane/n-hexane showed low recoveries such as 6.04%, 75.32%, 57.52% with florisil cartridge and 47.79%, 33.51%, 0.70% with silica one. Ethyl acetate/dichloromethane provided recoveries of 91.03% with florisil cartridge, while only 30.40% with silica one. Only one solvent (acetone/dichloromethane) showed more than 80% recoveries from both florisil and silica cartridge. Four acetone/dichloromethane (v/v) ratio were determined based on fluxametamid elution efficacy; 0/100, 5/95, 10/90, and 20/80 (Table 4). Except the 0/100 solvent ratio, other solvent ratios show more than 90% efficacy. The highest efficacy (101.0%) was shown from 5/95 acetone/dicholormethane (v/v). Furthermore, the first and second fraction of this ratio shows 100.8 % elution. Finally, 10 mL of acetone/dichloromethane (v/v) elution were chosen. GC analysis is not suitable to analyze fluxametamid because it has low vapor pressure (4.0 x 10-9 Pa at 25℃) and is instability against heat. Photodiodie array (PDA) was performed to scan from 210 nm to 360 nm prior to analysis of fluxametamid in the HPLC-UVD system. The highest absorbance was observed at 270 nm (Fig. 2). However, LC-MS/MS system was chosen because LOQ of HPLC-UVD was too high as 0.1 mg/kg. The separation was conducted with reverse-phase column (Unison UK-C18, 100 x 2 mm, 3 μm) with gradient of mobile phase. Formic acid in a moving phase acted as a protonization enhancer and helped ion response in [M+H]+ of fluxametamid. To ionic each molecule, the positive-ion mode of electro-spray ionization (ESI) were used. The optimal specific ion was chosen by analyzing selected-ion monitoring with total ion chromatogram and mass spectrum. 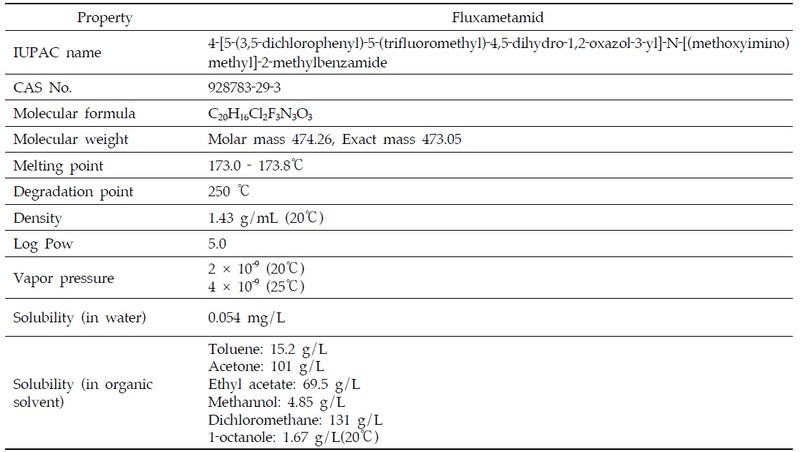 As the result of mass analysis by using fluxametamid standard solution (Mass 474.26, concentration 0.1 μL/mL), value of [M+H]+ was confirmed as 474 mass. The highest peak (at 40 V) for fluxametamid was confirmed by the adaptation of cone voltage variance. MS/MS analysis with MRM (multiple reaction monitoring) mode was used for investigating analysis selectivity and sensitivity at the optimized cone voltage. The best precursor/production ion pair was chosen by controlling collision energy at collision cell. The product ion shown the best selectivity was used for quantification ion, while the production ion shown the best sensitivity for qualification ion. Optimal analyzing condition and selected-ion of LC-MS/MS for fluxametamid summarized in Table 5 and Table 6. 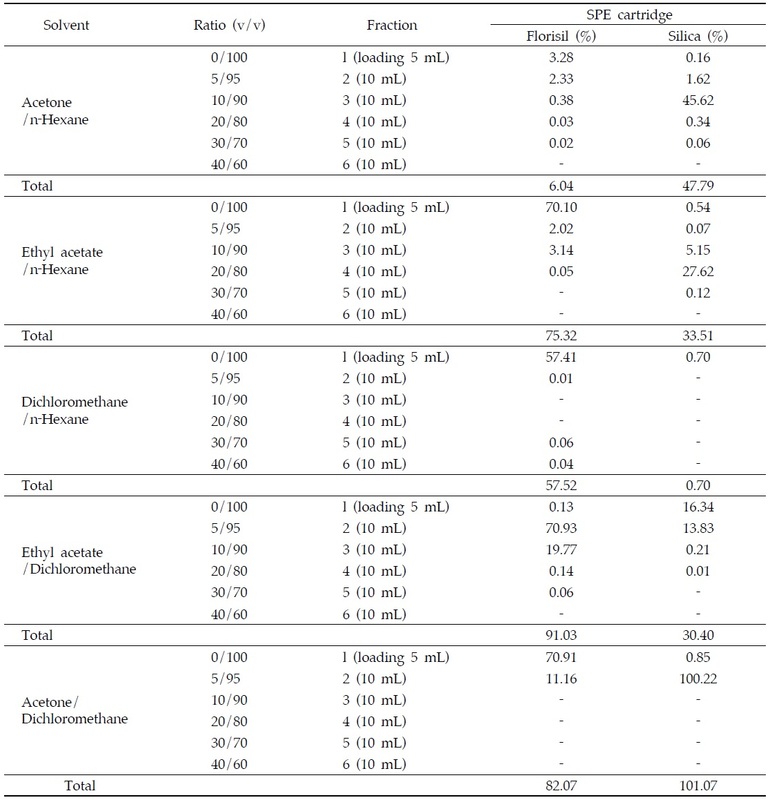 Matrix-matched calibrations of commodities were investigated for method validation (Table 7). Limit of detection and quantitation The limit of detection (LOD) and quantitation (LOQ) were determined by the ratio of signal-to-noise (S/N). LOD and LOQ were defined as the concentrations in sample at the S/N=3 and =10. The value of LOD and LOQ were 0.001 and 0.005 mg/kg, respectively. Linearity Matrix-matched calibration curve were constructed by plotting the peak area vs. the six concentrations (0.001-0.25 mg/kg range) of the analyte. Good linearity for fluxametamid (r2 > 0.99) was observed for all five food matrices (Fig. 3). 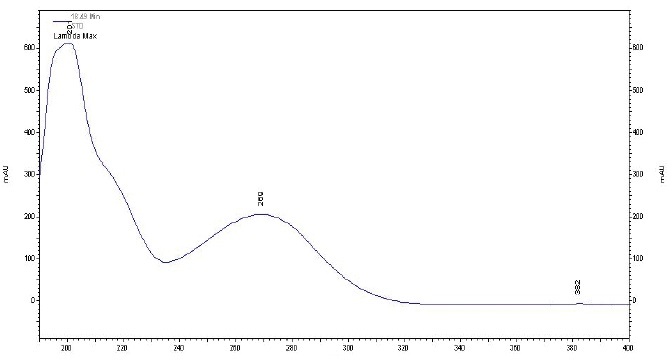 Selectivity The selectivity was confirmed by comparing representative chromatogram of standard working solution, blank, and fortified sample extracts. No endogenous components were observed at the retention time and m/z of the analyte. As the result, this method is confirmed to have a good separation and selectivity (Fig. 4). Accuracy and precision Recovery test were performed with three different levels (1, 10, and 50-fold of LOQ) - 0.005, 0.05 and 0.25 mg/kg for testing accuracy and precision. Each test was done with three replicates. Mean average accuracies were shown 82.24-115.27 %. The precision (shown as relative standard deviation) were not over 10% for all five samples. Thus, this method is acceptable to Codex guideline for residue analysis (CAC/GL 40). The analytical method for fluxametamid developed from this study consists of a single step (liquid-liquid extraction, SPE cartridge clean up and LC-MS/MS), which can be applied for all food matrixes. Additionally, this analytical method is suitable for routine analysis with reliable selectivity, sensitivity and accuracy. This study was carried out with the support of Ministry of Food and Drug Safety, Republic of Korea (Project No. 17161MFDS001). LC/MSMS Standard chromatograms of Fluxametamid stock solution at (A) 0.001 mg/kg, (B) 0.005 mg/kg, (C) 0.01 mg/kg, (D) 0.05 mg/kg, (E) 0.1 mg/kg and (F) 0.25 mg/kg. 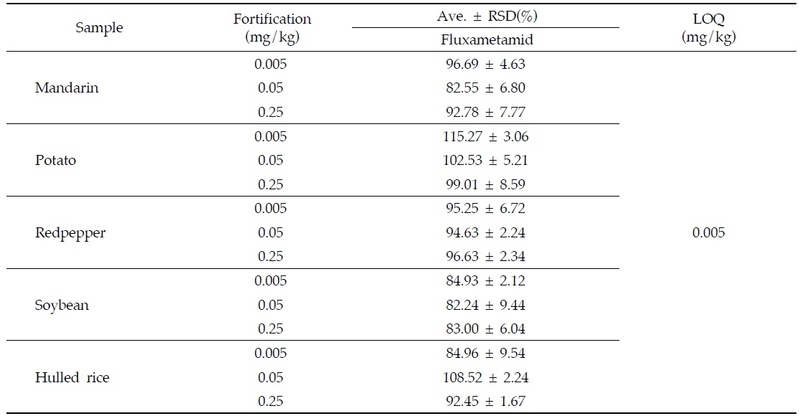 Representative MRM(quantification ion) chromatograms of Fluxametamid corresponding to: (A) standard solution at 0.05 mg/kg, (B) Soybean, Madarin control, (C) spiked at 0.005 mg/kg, (D) spiked at 0.05 mg/kg and (E) spiked at 0.25 mg/kg. 1. Ahn, K. G., Kim, G. H., Kim, G. P., Kim, M. J., Hwang, Y. S., Hong, S. B., Lee, Y. D., & Choung,M. G. ((2014)). Determination of amisulbrom residues in agricultural commodities using HPLC-UVD/MS.. The Korean Journal of Pesticide Science 18. 321 - 329. 2. Asahia, M., Kobayashia, M., Kagamia, T., Nakahiraa, K., Furukawab, Y., & Ozoec,Y. ((2018)). Fluxametamide: A novel isoxazoline insecticide that acts via distinctive antagonism of insect ligand-gated chloride channels.. Pesticide Biochemistry and Physiology 151. 67 - 72. 3. Bloomquist,J. R. ((2003)). Chloride channels as tools for developing selective insecticides.. Archives of Insect Biochemistry and Physiology 54. 145 - 56. 4. Kagami, T., Hori, M., & Haruyama,H. Studies on a novel insecticide, fluxametamide (Part2) Biological activity. 83. 5. Lee, S. J., Hwang, Y. S., Kim, Y. H., Kwon, C. H., Do, J. A., Im, M. H., Lee, Y. D., & Choung,M. G. ((2010)). Determination of captan, folpet, catafol and cholorothanonil residue in agricultural commodities using GC-ECD/MS. Korean Journal of Environment for Agricultural 29. 165 - 175. 6. Ozoe, Y., Asahi, M., Ozoe, F., Nakahira, K., & Mita,T. ((2010)). The antiparasitic isoxasoline A1443 is a potent blocker of insect ligand-gated chloride channels.. Biochemical Biophysical Research Communications 391. 744 - 749. 7. Zhao, C., & Casida,J. E. ((2014)). Insect γ-aminobutyric acid receptors and isoxazoline insecticides: toxicological profiles relative to the binding sites of [3H]fluralaner, [3H]-4′-ethynyl-4-n-propylbicycloorthobenzoate, and [3H]avermectin.. Jounral of Agricultural and Food Chemistry 62. 1019 - 1024.